When we’re traveling we like to try the local cuisine – souvenirs for our taste buds, as they say. Some are not things we’d probably choose to have again, such as maize beer. It made for a much better photo opp than it did beverage…But often we find things we would love to have again. 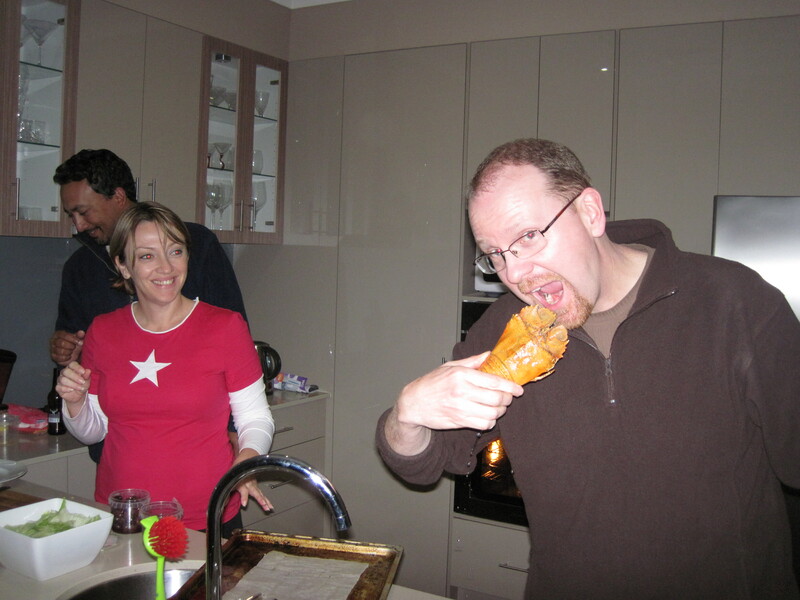 We’ve tried to re-capture some of those taste sensations back at home – with varying degrees of success. We loved the potato dish called rösti in Switzerland, but we could never get that one to work out for us. Same with Spanish tortilla, which seems so simple, but apparently, not so much. Heidi cocoa, however, also from Switzerland, we have mastered. Of course, it’s difficult to screw up hot chocolate with peppermint schnapps. We also did pretty well on re-creating Swiss raclette – boiled baby red potatoes with melted raclette cheese (seriously stinky cheese) and little dill pickles. We haven’t figured out how to import the Alps to go with it yet. In Africa we ate lots of creamy soups that the cooks made with a wooden utensil that sort of looked like one of those helicopter toys that’s made of dowels. The kind you rub back and forth in your hands and then it flies off, you know what I mean? It was just one long dowel with two short cross dowels in an X at one end. They put the vegetables and broth in a bowl and then would whip that thing around with their hands using the same helicopter motion. Before you knew it, soup. I tried several variations on this, with a blender, no less, and still I could not re-create this. I believe my soups all went down the sink, actually. That’s how bad they were. Oh well, one more reason to go back to Africa, right? You can buy this in upscale markets in the US. 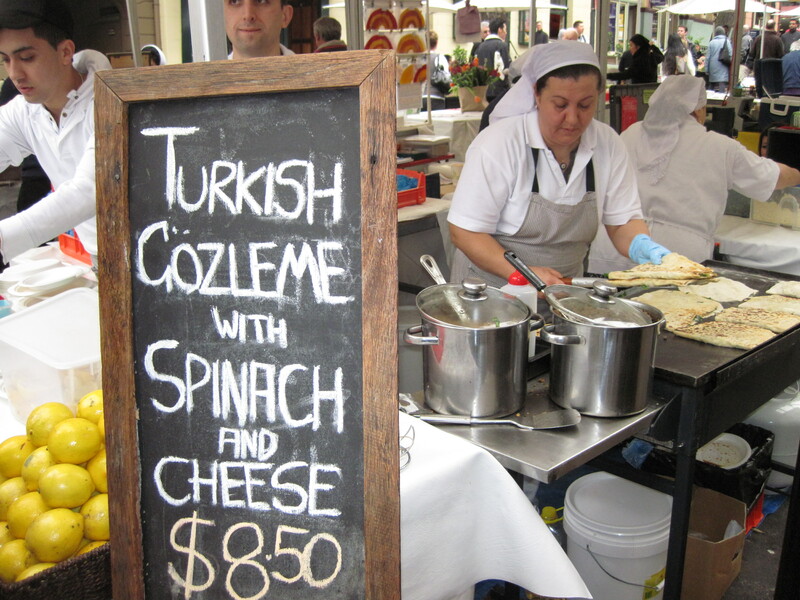 Gözleme was another Aussie taste treat we had at the Rocks market in Sydney – dough stuffed with cheese and spinach and cooked to order by a Turkish woman who had probably been doing it since she was small. Jeff made this for me on Valentine’s Day last year, and it was spot on. He had to get the recipe off the Australian allrecipes website! Super bonus points for him on that. He also found a recipe for dukkah, a nut and seed mixture which we discovered in the Rocks market, too. So tasty with olive oil dipped bread. Anzac biscuits (also known as cookies to us Yanks), are yummy dessert treats, but they do need golden syrup to be authentic. Some specialty stores sell it over here, and I think you could sub in maple syrup in a pinch. We won’t tell. Here’s a link to the recipe we’ve used that taste like the real thing. Don’t overcook ’em! 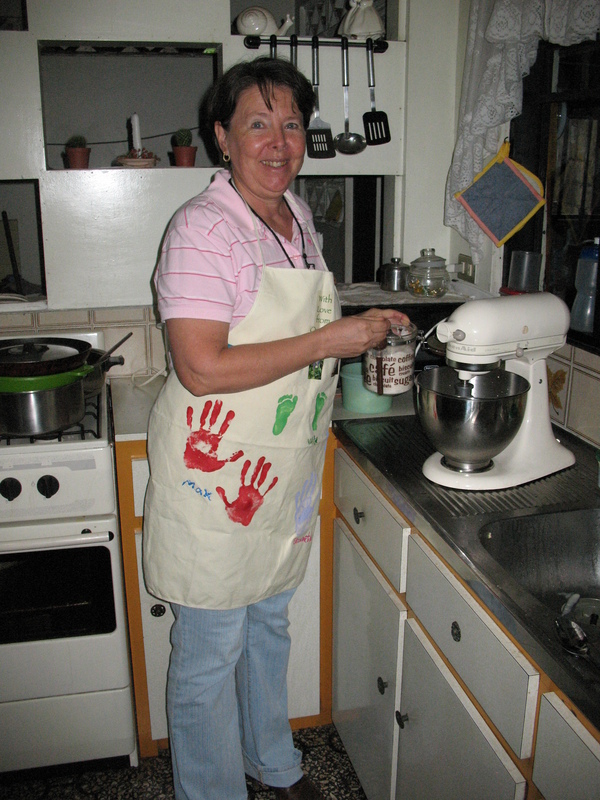 My Tico Mami teaching me how to cook Costa Rican food! From Costa Rica we have two favorite rice recipes – one for a meal, and one for a treat. Gallo pinto is a staple in Costa Rica. It’s made with day old rice, red peppers, onion, black beans, cilantro, and the secret ingredient, salsa Lizano (available on Amazon.com, of course). I studied in Costa Rica for two months during high school, and I am pretty sure I ate gallo pinto every day. I am pretty sure I wanted to eat arroz con leche every day, too, but I did not. My Tico mami did teach me how to make it, though, and when I want some comfort food, this creamy, cinnamony sweet rice dish is all I need. When I really need a taste of the tropics – which, let’s face it, when wouldn’t a taste of the tropics be a good idea? – I ask my favorite cabana boy to mix me up a lime in de coconut. 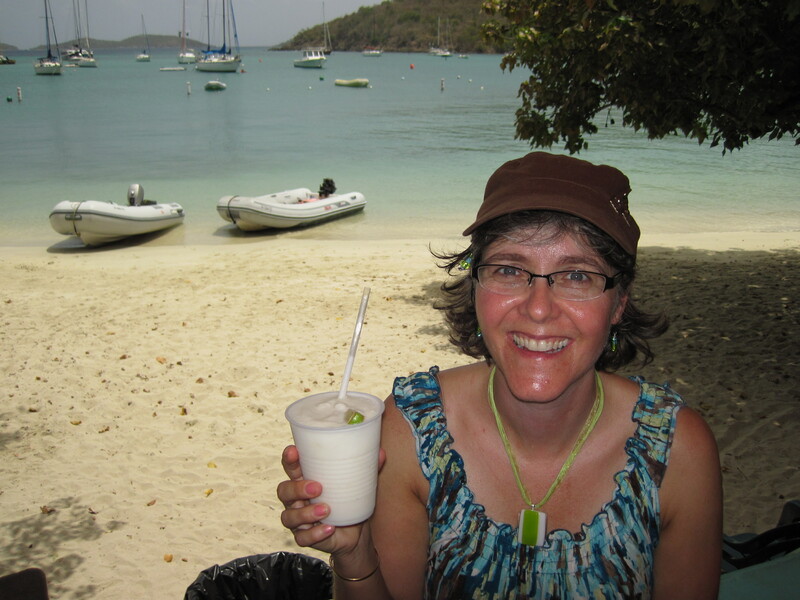 We tried and tried to re-create this amazing drink when we came home from the Virgin Islands, but we were unsuccessful. Not even the interwebs could help us. But we knew the bartender at the Beach Bar could, so we just called her up. Turns out you need to put the whole lime in there, even the peel! Mix up a little mango salsa a la Morgan’s Mango restaurant to go with the drinks, crank up the steel band drums tracks on the iPod, and it’s almost like you’re there. Well, at least it’s less painful to not be there. Have any favorite foods or drinks you’ve brought home from your travels for your cabana boy to whip up? Leave us a note in the comments, and enjoy your week or your weekend. Oooh, I forgot about crepes. Have not tried to make them, but love the crepe cart down on Hawthorne and 12th! Enjoy your week or your weekend. Take it slow! I am so glad that the OASL newsletter included your travel blog in the most recent edition. I have seen your “professional” book blog which I enjoy. I too love to travel and try new dishes. I kick myself for being a picky eater when I was growing up. My family lived in Rio de Janeiro, Brazil when I was in high school and we traveled all over South America and there are so many dishes I wished that I had tried. As an adult i have revisited Brazil and found an amazing fruit – fruta de conde – and it seems that there is no exact translation nor any way of getting hold of this wonderful fruit – it looks somewhat like an artichoke but the green leaves aren’t really leaves but the outer portions of pods that hold an amazing pudding-like fruit with a seed in the center. If I could find this fruit anywhere in the US I would move there and gorge myself – there would be no end of satisfaction! We (the love of my life [LOML]and high school sweetheart) have also traveled a lot. One of my favorite foods comes from Puerto Rico (LOML’s family lives in Puerto Rico) – Pastelles – more than a Mexican tamale, the “masa” is made of yuca, plantains, green bananas, and then stuffed with bits of ham, pork, olives and other tid-bits. It is very labor intensive and generally prepared at Christmas time.